After successfully putting a new OpenRules-based system in production, the bank extended the use of OpenRules to another mission-critical application related to risk management. Below you can read the description of this OpenRules success story. This case study describes a successful implementation of business rules within a large California bank with 80 billion in assets. The bank needed to modernize the existing onboarding system by adding over 600 new, dynamically-formulated KYC (Know Your Customer) questions. The new interaction logic was very complex, requiring the complicated UI to be dynamically modified for different types of customers, accounts, and planned account activities. The questions to be asked were dependent on previously-provided answers and already-known information about customers and their accounts. Hard-coding of such interaction logic into the existing onboarding system would be both cost- and time-prohibitive. Instead a radically new approach driven by externalized rules was implemented to significantly reduce implementation and maintenance costs as well as delivery timelines. To add new capabilities and seamlessly extend the old system to match the existing User Experience a new, rules-based system became a necessity. The bank evaluated several business rules frameworks including major commercial and open source products and selected the one that best matched the bank’s needs. As a result, the new system was successfully developed, tested, and deployed on the bank’s production servers using rules-based web services. The new system addressed the core challenges and saved an otherwise failing project allowing the bank to meet regulatory commitments and deadlines. create an organizational environment where Business and IT worked together as one team with a minimal learning curve. all rules defined declaratively, externalized out of the application code and can be understood and modified by new personal. Now the bank uses the same business rules framework for another mission-critical application related to risk management. This case study describes a successful implementation of business rules within one of the largest California’s banks for a highly dynamic web application that supports complex customer account management processes. The bank has more than 6,000 business users working in branches creating new and modifying existing customer accounts. The existing onboarding system was in production for years and used a traditional (not rules-based) GUI technology. To comply with regulatory requirements the bank needed to revamp their onboarding process by incorporating over 600 new, dynamically displayed questions and sections to complete KYC requirements for different types of customers and accounts that were being on-boarded. The bank faced major technical and organizational challenges. The interaction logic was very complex requiring the graphical views to be dynamically modified for different types of customers, accounts, and planned account activities. The questions to be asked were dependent on previously-provided answers and already known information about customers and their accounts. If such interaction logic was hard-coded again, then delivery of such a system (due to bugs and potential QA issues) and future maintenance costs would be time- and cost-prohibitive. So, the bank started to consider a rules-based approach that would allow externalizing the logic in the form of user-friendly business rules that could drive both interaction and composition of the user interfaces. Another challenge that the team had to solve was a seamless integration with the existing onboarding solution for users. Specifically, the requirement was to have end users not to be aware that they are leaving their existing application from beginning to end of the onboarding process. That required matching the existing UI experience and providing a seamless integration between the old and new systems. In the face of encountered difficulties with no solutions available on the one hand, and looming regulatory fines, on the other hand, the bank had to drastically rethink and seek for a solution that could still work. They opted for a solution that could utilize an off-the-shelf rules-based framework to meet complexity of the requirements. As a result, the new system was developed, tested, and deployed on the bank’s production servers using rules-based web application and web services frameworks. 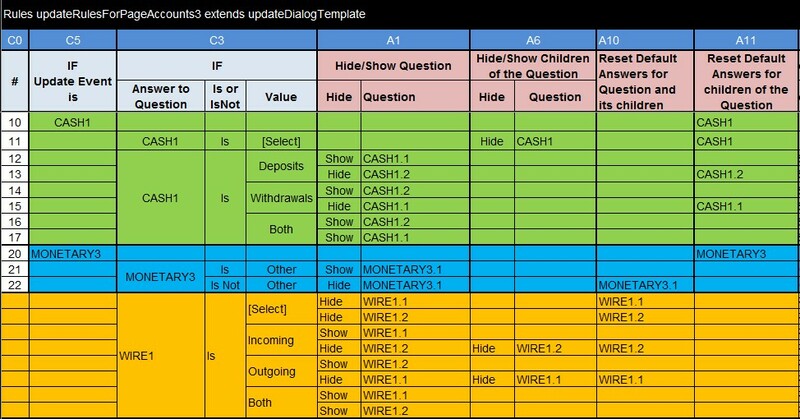 The selected rules-based approach allowed the banks’ business analysts and software developers to work as one team by adding new functionality and validating all combinations of questions/answers to identify any inconsistencies and flag them to meet strict regulatory and compliance requirements. As a result, the developed system proved to be very successful: (1) bank was able to save approximately 6 months as the result of the pivot and therefore met the originally committed timelines; (2) the system was developed in-house with very little external professional help which reduced budget 3 times by saving on extensive customizations that would have been required to a vendor-based solution. Prior to this implementation, the existing onboarding system was in production for years and used a traditional (not rules-based) GUI technology to support more than 6,000 business users working concurrently on creating new and modifying existing customer accounts. The existing system was quite efficient, but the entire interaction and presentation logic was hard-coded, controlled by experienced programmers, and it was difficult to make any changes. To comply with new KYC (Know Your Customer) regulations and address them for each of their unique channels – each servicing quite diverse customer types. It was necessary to implement complex, dynamic flows with overlaying UI interactions including different operating modes, new complex rules which drive system behavior in response to many of the customer types, user actions, ability to pause, save, resume, restore, or cancel different branches of the dialogs, hard stops, etc. The bank needed to add over 600 new, dynamically formulated questions depending on customer or account types, planned account activities and previously provided answers. The existing solution was not able to accommodate new requirements neither in time for delivery timelines nor from the cost perspective. A new approach – using rules to drive the complexity and reduce the cost of development became the only viable option. The new approach essentially improved the flexibility of decision making and expedite the development and testing processes. The new rules-based approach had positive impact on the bank’s employees giving them the common goals and tools to achieve them. Previously business people specified what to do and written specifications were given to developers for implementation. Then the implemented software was given to QA engineers for testing. With a new approach, all these 3 categories of employees were combined in one team constantly working together under the same highly challenging deadline. As a result, the team (BA+DEV+QA) added new functionality feature-by-feature following immediate testing, correction, and integration. Even the managers could see, control development and testing progress every day as new functionality being added and available to all involved people all the time. Ease of learning the system implementation by new staff members. The best proof of the positive impact is the fact that after successfully putting a new onboarding system in production, the bank now uses the same business rules framework and a similar development approach for another mission-critical application related to risk management. The bank also needed to take into account a lead time for development of training materials and provide necessary training in thousands of branches that required to minimize necessary changes in the user experience. Complexity of the interaction logic would make writing the exact specification of new features a lengthy process. The alternative process allowed business analysts to be directly involved in the rules-based development and testing and reducing SDLC time. With the new rules-based approach, the last challenge was converted to an essential advantage allowing business people to work in concert with developers to dramatically speed-up development and testing processes for new business rules and graphical components. It incentivized the bank to combine business analysts, developers and testers in one team working together by gradually adding new functionality without the necessity to create intermediate specification documents. The new business rules platform licensing fees are many times less to compare with the existing platform that caused an essential cost saving for the bank. The selected approach reduced time-to-market twice by 6 months (twice less) and essentially simplified specification-implementation-testing cycle allowing the bank to meet a challenging deadline. The newly developed system not only added a new required functionality but improved the quality of the solution by making it easier to modify, extend, and to learn for new employees. All of the UI logic was documented in a simple and intuitive, Excel based decision tables like the one shown above. Business specialists and developers working in concert. General-purpose business rules platforms usually require the development of rules repositories from scratch. Find a platform that already supports domain-specific templates and rules repositories with an ability to be extended and customized. The bank originally implemented the approach only for its Retail Channel. Other channels used different platforms. By switching to a rules-based approach and by selecting the right business rules platform allowed the Retail channel to complete the delivery of the KYC requirements in time in its complete scope and without any performance or quality issues compared to other internal channels. 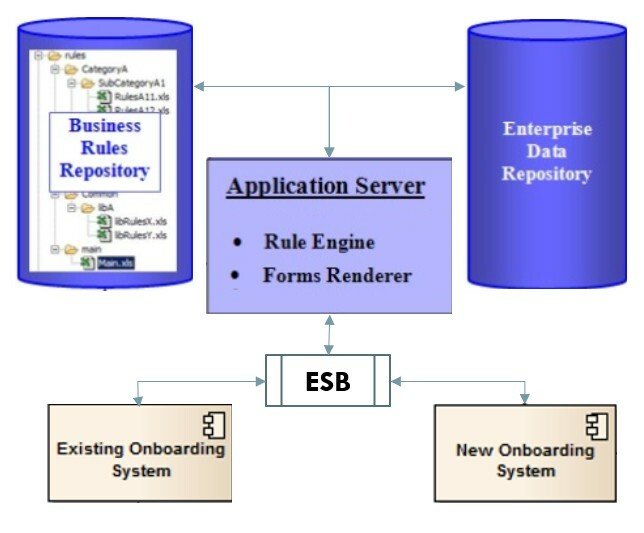 This architecture allowed the existing and new onboarding systems to co-exist (at least initially) and to exchange the customer’s data because they share the same Enterprise Data Repository and Enterprise Service Bus (ESB). 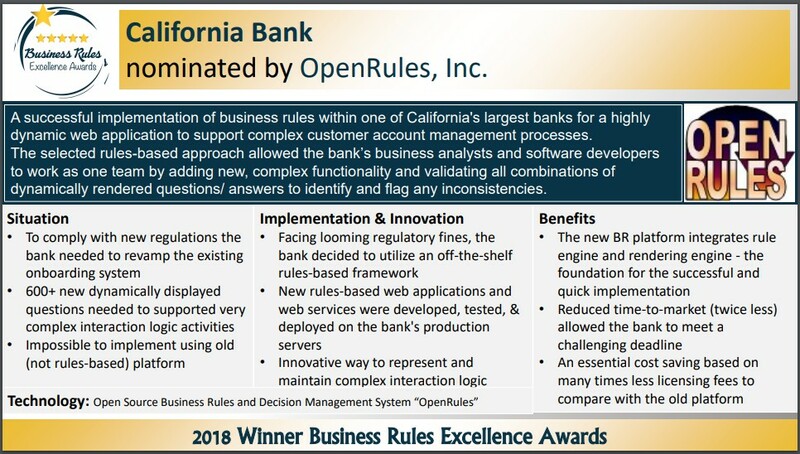 To develop a new on-boarding system the bank selected OpenRules®, an open source Business Rules and Decision Management system (http://openrules.com). It comes with a built-in component, called “OpenRules Dialog” that was specifically designed for building dynamic web-based questionnaires. The predefined and easily customizable templates for interaction rules and for page, section, and question layouts played the key role in the success of this development. 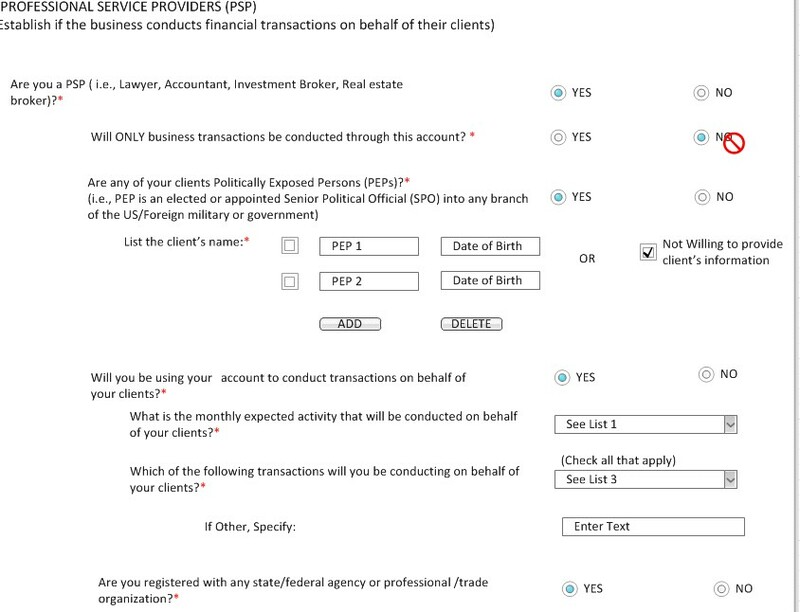 The bank also utilized OpenRules consulting, training, and technical support services. OpenRules fulfilled the bank’s needs with a quickly-competed POC to prove the ability to meet the business requirements; positive reference check; straight-forward Excel-based UI for creation and maintenance of business rules and graphical forms; simple rules configuration logic with predefined and extendable rule templates; minimal learning curve; simple licensing requirements; low cost and a quick development schedule; very responsive technical support.